Skinny Gut. That’s something I do not exactly have today. And here’s why. I haven’t freaking been able to work out in like, four days! It’s not that i haven’t wanted to, because believe me I prefer to work out every single day. But I’ve been really in a strange place with my health recently. For some reason I’ve just been SUPER stressed out and it’s been giving me the weirdest issues ever. Like. My chest has felt weird. My digestion has been off. I’ve been cramping. It’s just not a good situation. So basically I cut out all supplements from my life and have been really focusing on my nutrition. But you know I still needed a protein shake, so I was googling different natural protein powders, and, as you might have guessed, Renew Life popped up as a good ‘clean’ protein powder. I’m pretty sure I already identified the BEST all natural protein powder, but it never hurts to try a new one, right? So I grabbed a tub of RenewLife Skinny Gut and prepared for it’s arrival. 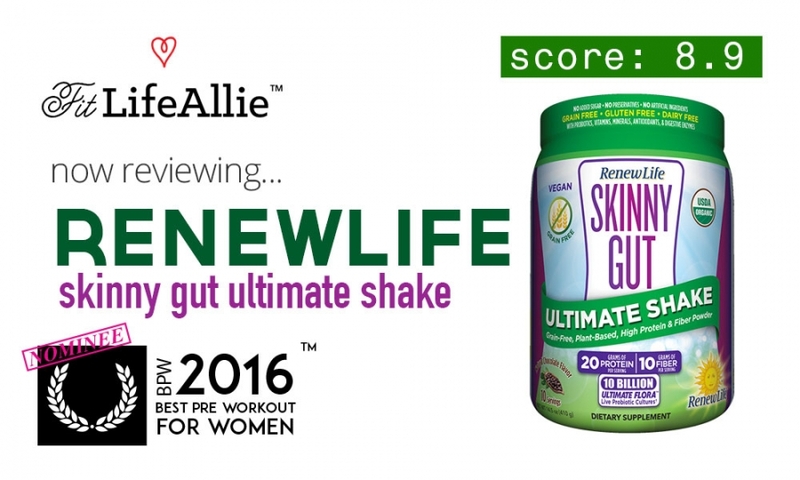 Does Renew Life Skinny Gut Ultimate Shake Taste Good? I was actually kinda hoping that Skinny Gut Protein shakes would tastes a little bit better. I didn’t even really have high expectations for it either. I mean. With most of these plant-based proteins, you get quite a few of them that taste the same, and not in a good way. Most of these protein powders that are all natural taste like dirt. Skinny gut has an ok taste compared to some of them, but really what gets me is the texture, and then it also has a very strange aftertaste that for the LIFE of me I have not been able to place. I don’t know if it’s a certain ingredient that Skinny Gut has that the others don’t, but it definitely seems like it’s one very specific ingredient that is making that strange taste. I think aside from that, to describe the chocolate flavor itself, I would describe as this taste as a standard chocolate. Not dark. Not milk. Just sort of in the middle somewhere. It’s semi-sweet and semi-bitter. I feel like it lacks ‘punch’ in the sense that the darker chocolates are big and bold in their bitterness, while most of the milk chocolate flavored protein powders are more sweet and smooth. I will give Renew Life a B plus on their flavoring. It’s pleasant, but the after-taste and texture could be improved to bring it up into the ‘A’ range. Let’s look at the ingredients now. Overall I think this formula is pretty good, but not great. The good parts are the ‘goodies’ that they included in addition to the basic protein. I really like the fruit and veggie antioxidant blend because it has goodies like cherry, pomegranate, strawberry, kale, carrot, spinach, and more. The BAD part of the Renew Life Skinny Gut Ultimate Meal formula for me personally is just the amount of fiber in here. I feel like at times I would be drinking this shake and literally within minutes be on my way to the ladies’ room. But that’s the way flax always is for me. I just don’t like flax and my stomach has a really hard time dealing with it. But I think that might be unique to me. In terms of macros, these shakes are quite attractive since they include a whole broad range of vitamins along with 20 grams of protein, and relatively low fat content (just 2.5 grams per serving). The calorie count is also totally manageable at just 140 calories per scoop. Just like the formulation itself, the their are some pros and cons to the RenewLife Skinny Guts shakes from a packaging standpoint as well. We’ll start with the bad, so that we can end with the good. I’ll let you read that again to let it sink in. Lol. The bad parts are easy to call out. The white sort of shape in the background of ‘Skinny Gut’ looks legit like a pad, and it doesn’t do anything for the aesthetics. The shapes in general are now good. The green banner is just too random and lacks hard edges. It’s ugly. Overall arrangement of the information of the Skinny Gut protein info needs some real work as well. The Organic logo and the gluten-free logos need to be aligned to one another vertically. They look terrible. The things that I LIKE about the Skinny Gut protein powder from an appearance standpoint are the colors, and the typography. The OVERALL result of all the elements, both good and bad, also nets out to a positive, which is why I gave them a reasonable score overall for the appearance. The colors are really what makes the overall RewnewLife packaging ‘work’ though. Purple and green work really well together, and they look beautiful with the blue sky and sunlight graphics in the outer edge areas. Again. The overall feel is nicely balance and very pleasing to the eye.